When the great apostasy begins — and I believe this will happen during the Year of Faith — most Catholics will leave the Church. They will no longer call themselves Catholic. They will no longer attend Mass, even on Christmas and Easter. They will no longer financially support their (former) parish. Now, to be fair, Cardinal Ratzinger/Pope Benedict XVI was not talking about the great apostasy specifically. He was talking about the possibility (not a prediction by him) that the Church might need to become smaller in order to become holier. But I see that his words are true, and that they apply to the great apostasy. Why do most Catholics leave the Church at that time? It is because they already left the Church long before that time, in their hearts and minds. 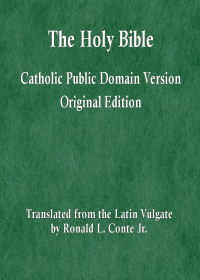 Most Catholics do not believe what the Magisterium teaches, do not know what the Magisterium teaches, do not want to know what the Magisterium teaches. They do not acknowledge that the Church has the role of teaching them with authority on matters of faith and morals. Most Catholics are in a state of at least material heresy; many in a state of formal heresy. During the Year of Faith, the new Pope will require the faithful to believe and practice what the Church teaches in order to receive the Sacraments. Most Catholics will be outraged that Catholics would be required to believe what the Catholic Church teaches, and they will depart from the true Faith. What do you make of this message from the BVM to Pedro Regis: Is this a message about the distant future? 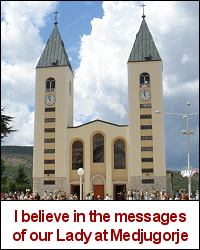 is the message that I transmit to you in the name of The Most Holy Trinity. The tribulation is one long period of time, divided into two parts. Mary is speaking about the tribulation as a whole. The first and second parts both have a great apostasy; it is worse in the second part. Only the second part of the tribulation has the Antichrist. However, the spirit of the antichrist (i.e. the attitudes that lead to his eventual reign centuries later) is in the world today. Although there are obviously Catholics who actively reject teachings that they know to be true, there are practicing Catholics who are faithful to the teachings of the Church that they know and are not actively rejecting Church teaching. Some Catholics do commit intrinsically evil acts without knowing that the act is intrinsically evil. There are married Catholic couples (even those that are otherwise faithful to the Church’s teaching) that do commit unnatural sexual acts between the husband and wife, even if they do not know that such acts are always gravely sinful. Some Catholics will obviously go to confession and repent of their gravely immoral sexual acts once they discover that their sexual acts are gravely sinful. Even after the next Pope is elected, there will be intrinisically evil acts, gravely immoral acts, and actual mortal sins committed by Catholics who have not left the Catholic Church. Many faithful Catholics will not know every teaching of the Catholic Church after the next Pope is elected. At least some of the currently unfaithful Catholics will repent of their grave sins, accept what the Church teaches, and remain in the Catholic Church, and not all of the currently unfaithful Catholics will depart from the Catholic faith when the next Pope is elected. Why do you say that the new Pope will require the faithful to believe and practice what the Church teaches in order to receive the Sacraments, even if some of the faithful Catholics who are in the state of grace do not know everything that the Catholic Church teaches? Why do you say that most Catholics will be outraged that Catholics would be required to believe what the Catholic Church teaches? I was referring to persons who know what the Church teaches, and yet reject what they know. Very many Catholics think that they can believe whatever they like, knowingly reject Church teaching, and still receive the Sacraments.